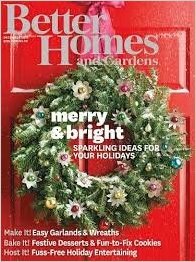 HOT OFF THE PRESS – This season’s Better Homes and Gardens Holiday 2013 edition! Chock full of fun and unexpected Christmas crafts and decorating ideas……including……US! Designer Laura Langworthy created this cozy living room which can be found in an article entitled “Shared Vision” that starts on Page 122. The custom drapery hardware featured is our FW 230 Finial paired with our 2″ smooth round rod. The rods and finials were painted and the finials accented with Antiqued Gold Leaf. The placement of the tree is perfect, as the gold ornaments and twinkle lights pick up the Gold Leaf Accents in the finials and the gold tones in the area rug. With the fire burning and the tree all trimmed I’m tempted to get myself a cup of hot cocoa and curl up on the couch with a good book! How about you? New England Home Safe at Home! It’s a Grand Slam for a Boston Ball Player and his family! Our 2″ Smooth Traversing Rod is featured in this beautifully serene family room in the May-June 2013 edition of New England Home. This rod was painted with Benjamin Moore’s Stone Brown in a high gloss finish, to give the look of metal. In the second picture – this family is safe at home plate – dinner plate, that is! I love how the accordian loops from the light fixture above the dining room table are echoed by the rings in our 2″ Smooth Ring Traversing Rod! Delightful! 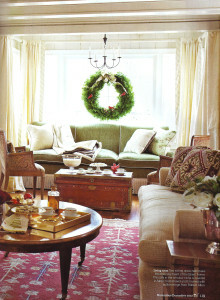 In the December, 2012 edition of Traditional Home Magazine, Designer Laura Langworthy has created a room which is described as ‘heart-warming’ and ‘warm and cozy’ by on-line readers. 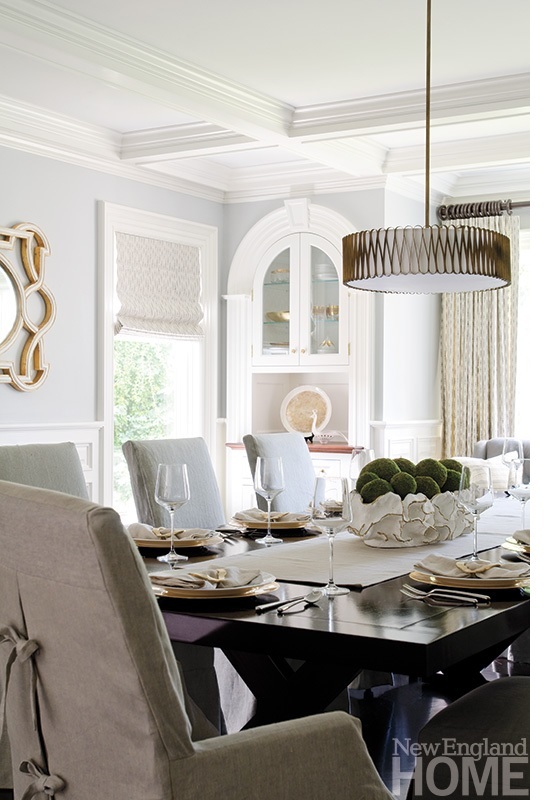 Our 2″ Smooth Round Rod with our FW 230 Finials assist in the overall charm of this room. Be sure to check out the Mitered Bay Rod above the couch – the perfect solution for this quaint alcove! 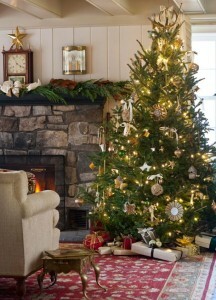 It is described in the article this way…”Nothing says Christmas like a tree and roaring fire. 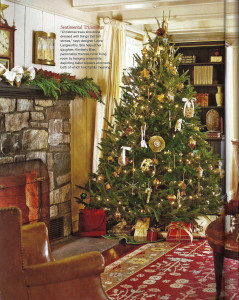 Simple white lights on the tree illuminate its folksy ornaments without competing with the room’s color palette. Fresh boughs over the mantel add another layer of charm.” We whole-heartedly agree! Just click on the ‘Rod View’ images to see them up close! 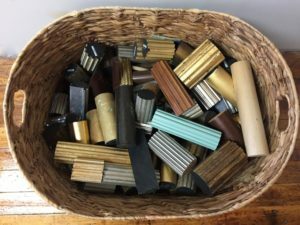 In an article entitled ‘Worldly Goods’, in Elle Décor on Page 54, you see our 1 3/8″ Twisted Rods which have been custom stained for New York Showroom. I love the use of white in this room – it is a spacious, airy room to begin with, and painting the walls and woodwork white really allows all the whimsy going on to have real legs to stand on. From the texture of the big furry pillows to the use of industrial furnishings – everywhere you look there is something different going on and the accent colors in this room are so fun! Our Twisted Rods seem to echo the zig-zag of the rug in the foreground – giving balance to the overall space. Our work was once again seen in the March 2012 edition of Connecticut Cottages & Gardens Magazine in this beautiful Colonial Revival designed by Katherine Cowden. The draperies are perfection – and our custom drapery hardware gets the nod for best supporting character! It is difficult to tell from this picture, but there is just a hint of gold leaf on the FW119 Finials – just enough to add an air of old world charm! 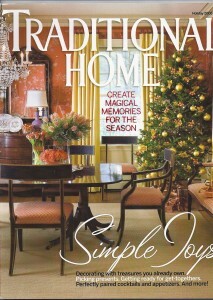 Traditional Home Magazine, Holiday 2008, Cover! 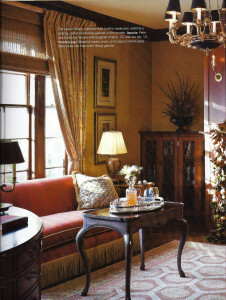 We were overjoyed to learn that our custom drapery hardware order for Miles River Sewing and designer Gerald Pomeroy, made it into the Holiday 2008 edition of Traditional Home Magazine. Not only did we make it into Pages 72 and 77, but we are on the cover!!!! Featured are our 2″ smooth round rods with accented FW 228 Finials. The bronze accent color that was used truly brought out the color of the Bronze Metal Rings. The mixing of the hard Bronze Metal Rings with the lux color chosen for the wooden rods and finials is sheer perfection! The end result, as you can plainly see, is a beautifully easy and elegant accent to this gorgeous room. Click on the ‘Rod View’ images to see them up close!